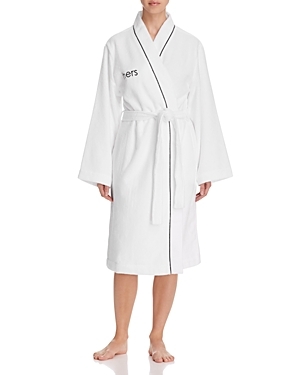 French style bathrobes. Wrap yourself in comfortable style. Self belt with tie loops, patch pockets, shawl collar. Cotton/modal. Machine wash. Made in Turkey Self belt with tie loops, patch pockets, shawl collar. Cotton/modal. 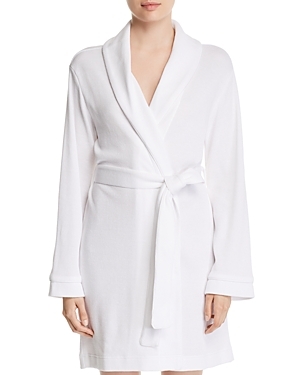 Machine wash. Made in Turkey Crafted in plush terry cloth, this bath robe by Hudson Park features contrasting piped trim at the collar, on-seam pockets and a self-tie belt. 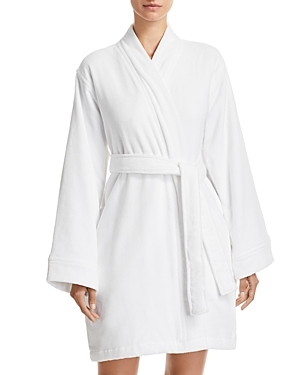 Velour shawl collar, detachable self-tie, slit pockets Crafted with soft cotton terry and a pique-knit design at the collar and belt, this bath robe from Lacoste Home provides superior comfort and style ideal for shower time and simply relaxing around your home. Woven of Turkish cotton terry, prized for its absorbency and texture, our signature robe is the softest and plushest you'll find. Slip into our PB Classic Terry Slippers to nurture your feet with soft, plush comfort. After the bath, they’re a perfect companion to the matching robe Like the wraps offered at grand hotels, our piped robe is tailored to keep you comfortably snug. 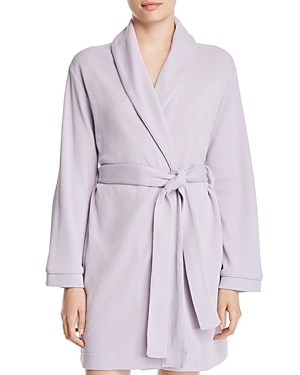 This luscious wrap incorporates the best features of robes from the world’s most luxurious spas. These sumptuous slippers are as relaxing and plush as those of the world’s most luxurious spas. After the bath, our Waffle Weave Resort Slippers are a perfect companion to the matching robe. 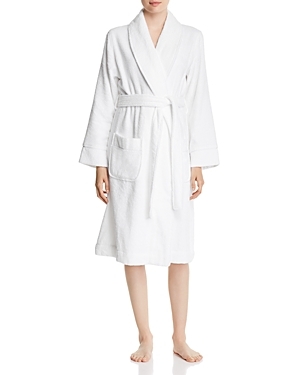 Your favorite absorbent cotton robe, made even softer with a touch of TENCEL. It’s a cozy way to increase your home’s sustainability footprint. 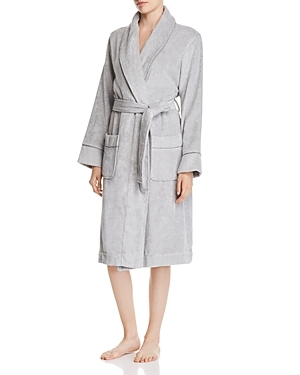 The ultimate in luxurious comfort, our superior-quality faux fur robe is as indulgent as it is beautiful. The faux fur trim is exceptionally woven from the finest materials for a sumptuously plush feel, and its handsome texture beautifully emulates the inherent softness and color variation of genuine fur. Enjoy a spa treatment at home with this relaxing gift from Tri-Coastal Design, a fluffy robe and a collection of bath essentials. Lise Charmel "Art et Volupte" short robe in sheer lace. Scalloped neckline; open front. Long sleeves. Self-tie sash at waist. Scalloped hem. Nylon/polyester. Lise Charmel "Ecrin Desir" short robe in sheer lace. Scalloped neckline; open front. Short sleeves. Self-tie sash at waist. Scalloped hem. Nylon/polyester. Lise Charmel "Virtouse" robe with tonal lace trim. Shawl collar; open front. Three-quarter sleeves. Self-tie sash at waist. Relaxed silhouette. Straight hem. Silk/nylon/spandex. Lise Charmel "Splendeur" robe with contrast lace trim. Shawl collar; open front. Three-quarter sleeves. Self-tie sash at waist. Relaxed silhouette. Straight hem. Silk/cotton/nylon. Lise Charmel "Dressing Floral" robe in lace. Shawl collar; open front. Three-quarter kimono sleeves. Self-tie sash at waist. Straight hem. Viscose/rayon/nylon/cotton/silk. Lise Charmel "Splendeur" robe with contrast lace trim. Shawl collar; open front. Three-quarter sleeves. Self-tie sash at waist. Relaxed silhouette. Straight hem. Silk/cotton/nylon. Lise Charmel "Dressing Effeuillage" robe in floral-print. Shawl collar; open front. Three-quarter sleeves; lace trim. Self-tie sash at waist. Straight hem. Lise Charmel "Resille Lotus" robe in floral lace. Scalloped neckline; open front. Half kimono sleeves. Self-tie sash at waist. Scalloped hem. Lise Charmel "Frisson Vegetal" robe in solid jersey. Shawl collar; open front. Long sleeves; lace cuffs. Self-tie sash at waist. Relaxed silhouette. Scalloped lace-trim hem. MicroModal® rayon/silk/spandex/nylon/polyester. Lise Charmel "Corolle Fauve" robe in exclusive animal-print floral motif. Shawl collar; open front. Three-quarter sleeves; lace trim. Self-tie sash at waist. Straight hem. Polyester/spandex/nylon. Lise Charmel "Splendeur" robe with lace hem. Notched collar; button front. Long, wide sleeves. Relaxed silhouette. Scalloped hem. Silk/cotton/nylon. Polyester Made from 100% slipsilk, the slip robe features a wrap around design with an adjustable slipsilk waist tie and stylish splits on each side. Slipsilk is specially-commissioned and made to our exacting standards, developed and refined over ten years to provide the ultimate combination of shine, thickness, softness and durability. We use the highest grade (6A) long fibre mulberry silk, with a thickness of 22 momme and enforce the strictest quality guidelines, including non-toxic dyes. Made from 100% slipsilk, the slip robe features a wrap around design with an adjustable slipsilk waist tie and stylish splits on each side. Slipsilk is specially-commissioned and made to our exacting standards, developed and refined over ten years to provide the ultimate combination of shine, thickness, softness and durability. We use the highest grade (6A) long fibre mulberry silk, with a thickness of 22 momme and enforce the strictest quality guidelines, including non-toxic dyes. Made from 100% slipsilk, the slip robe features a wrap around design with an adjustable slipsilk waist tie and stylish splits on each side. Slipsilk is specially-commissioned and made to our exacting standards, developed and refined over ten years to provide the ultimate combination of shine, thickness, softness and durability. We use the highest grade (6A) long fibre mulberry silk, with a thickness of 22 momme and enforce the strictest quality guidelines, including non-toxic dyes. Made from 100% slipsilk, the slip robe features a wrap around design with an adjustable slipsilk waist tie and stylish splits on each side. Slipsilk is specially-commissioned and made to our exacting standards, developed and refined over ten years to provide the ultimate combination of shine, thickness, softness and durability. We use the highest grade (6A) long fibre mulberry silk, with a thickness of 22 momme and enforce the strictest quality guidelines, including non-toxic dyes. Fleur't "Take Me Away" robe in slinky jersey with back inset panels. Shawl collar; open front. Three-quarter sleeves. Self-tie sash at natural waist. Relaxed silhouette. On-seam pockets. Asymmetric hem. Rayon/spandex. Fleur't "Take Me Away" robe in slinky jersey with back inset panels. Approx. 34.5"L from shoulder to hem. Shawl collar; open front. Three-quarter sleeves. Self-tie sash at natural waist. Relaxed silhouette. Fleur't robe in solid jersey-knit. Approx. 36"L from shoulder to hem. Shawl collar; open front. Long sleeves. Silk belt at waist. Ruched at back for fit. Side seam pockets Straight hem. Rayon/spandex. Christine Lingerie "Adrift" short robe in floral-print. Shawl collar; open front. Three-quarter sleeves. Self-tie sash at waist. Relaxed silhouette. Straight hem. Silk. Three-quarter kimono sleeves. Self-tie sash at waist. Side seam pockets. Relaxed silhouette. Even hem falls to ankles. Silk Christine Lingerie "Camille" short robe in floral print. Shawl collar; open front. Three-quarter kimono sleeves. Self-tie sash at waist. Side seam pockets. Even hem. Christine Lingerie short robe in kaleidoscope-print charmeuse. Shawl collar; open front. Three-quarter sleeves. Self-tie sash at waist. Side seam pockets. Straight hem. Silk. Open front; self-tie sash closure at waist. Three-quarter kimono sleeves. Relaxed fit. Mid-calf length. Christine Designs "Bijoux" long robe in charmeuse. Wrap front. Long sleeves with lace cuffs. Self-tie belt. Slash pockets at hip. Fluid A-line silhouette. Body, silk; lace, nylon/cotton/spandex. Christine Designs "Bijoux" long robe in charmeuse. Wrap front. Long sleeves with lace cuffs. Self-tie belt. Slash pockets at hip. Fluid A-line silhouette. Body, silk; lace, nylon/cotton/spandex. Christine Designs "Bijoux" long robe in charmeuse. Wrap front. Long sleeves with lace cuffs. Self-tie belt. Slash pockets at hip. Fluid A-line silhouette. Body, silk; lace, nylon/cotton/spandex. Christine Designs "Bijoux" short robe in charmeuse with lace trim. Wrap front. Short sleeves. Relaxed fit. Self-tie waist. Silk; lace, nylon/cotton/spandex. Christine Designs "Bijoux" short robe in charmeuse with lace trim. Wrap front. Short sleeves. Relaxed fit. Self-tie waist. Silk; lace, nylon/cotton/spandex. Christine Designs "Bijoux" short robe in charmeuse with lace trim. Wrap front. Short sleeves. Relaxed fit. Self-tie waist. Silk; lace, nylon/cotton/spandex. Christine Designs "Bijoux" long robe in charmeuse. Wrap front. Long sleeves with lace cuffs. Self-tie belt. Slash pockets at hip. Fluid A-line silhouette. Body, silk; lace, nylon/cotton/spandex. Christine Designs "Bijoux" short robe in charmeuse with lace trim. Wrap front. Short sleeves. Relaxed fit. Self-tie waist. Silk; lace, nylon/cotton/spandex. Pour Les Femmes long robe in gauze weave. Shawl collar; open front. Long sleeves. Self-tie sash at waist. Straight hem. Cotton. Pour Les Femmes lightweight robe. Shawl collar; open front. Long sleeves. Self-tie sash at waist. Relaxed silhouette. Straight hem. Cotton. Modal, spandex Modal, spandex; nylon, spandex contrast Eberjey "Odile" short robe in solid jersey. Hooded neckline; open front. Long sleeves. Self-tie sash at waist. Relaxed silhouette. Straight hem. Pima cotton/modal/spandex. Eberjey "Kinga" short robe with lace insets. Shawl collar; open front. Long sleeves. Self-tie sash at waist. Relaxed silhouette. Straight hem. Modal/spandex; nylon/spandex lace. Super-soft jersey with contrast lace-trim. Shawl collar; open front. Long sleeves. Hem hits above knee. Modal/spandex; hand wash, cold. Eberjey soft jersey robe. Shawl collar; open front. Three-quarter lace-trimmed kimono sleeves. Self-tie at natural waist. Bedhead short robe in "Wild Kingdom" leopard print. V neckline; self-tie waist. Kimono sleeves. Pockets with piping detail. Cotton/spandex. Bedhead kimono robe in gingham print. Shawl collar; open front. Self-tie sash at waist. Patch pocket at hips. Relaxed silhouette. Straight hem. Cotton/spandex. Bedhead kimono robe in "Wild Kingdom" animal print. Shawl collar; contrast piping. Three-quarter kimono sleeves. Self-tie sash at waist. Patch pockets at hips. Relaxed silhouette. Straight hem. Cotton/spandex. Bedhead kimono robe in hydrangea print. Shawl collar; open front. Half kimono sleeves. Self-tie belt at natural waist. Front patch pockets. Mid-thigh length. Cotton/spandex. Bedhead kimono robe in floral jewels print. Shawl collar; open front. Self-tie sash at waist. Patch pocket at hips. Relaxed silhouette. Straight hem. Cotton/spandex. Bedhead kimono robe in "Wisteria" floral print. Shawl collar; open front. Self-tie sash at waist. Patch pocket at hips. Relaxed silhouette. Straight hem. Cotton/spandex.